The Pros and Cons of this Sportstech VP210 Vibration Plate. 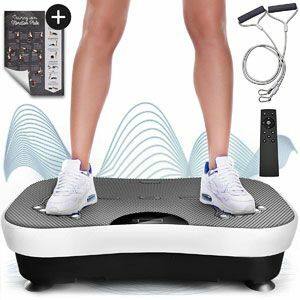 The quality of the workout and addition features on this Sportstech VP210 Vibration Plate is pretty good for most first-time users. 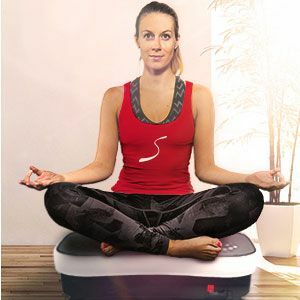 There is plenty within the design and build of this Sportstech vibration plate to ensure that users can find a setting, position and workout approach that suits them. It all starts with the vibration from the motors. Users can switch between intensity levels via a touch display on the top of the device. The 500w motor delivers a powerful enough vibration to have an impact on different muscle groups. Some say that while the highest settings are a little loud, they seem to be effective. There are hopes that the movements will help users to lose weight and improve the tone of certain muscles. The quality of the workout and experience continues with the little pressure points on the surface and the use of exercise bands. This magnetic foot reflexology adds a secondary function to the machine. The impact of this will depend on the size of your feet and your position during exercises. The bands are a nice touch to offer resistance training for the arms and some balance exercises. Users can refer to the wall chart for guidance on how to use them. However, as you will see below, this is about it for information. When it comes to the actual build and design of the system, there seem to be few complaints. This isn’t the most compact model around, but that does mean that it is a solid, reliable option. The surface has a decent amount of grip and enough width to keep users steady. The console isn’t too hard to use either. Unfortunately, there are quite a few areas where the designers could improve this Sportstech VP210 Vibration & Massage Plate in the future. There is an obvious problem that many users have experienced with this device. Everything looks great when they take it out of the box, but then they have to decipher the manual. There are three levels of annoyance here. First of all, the thick manual contains many languages, so there isn’t actually that much inside about the machine and its functions. Secondly, the instructions that are in English are poorly translated and difficult to understand. Thirdly, it directs users to an online video via a QR code to learn more. This is useless for those without a smartphone and – unsurprisingly – the video isn’t in English either. At this point, it makes more sense for new users to play around with the buttons and figure it out themselves. There are some other aspects to this vibrating plate that could be improved in future models. The first is the music system. The device offers the chance to pair up a phone, or other device by using Bluetooth streaming. The results could be better as the sound quality from the machine isn’t great. Again, it might make more sense for users to find an alternative approach and listen on their phone. Then there is the design of the remote. It is a large object, not unlike that of a TV, and isn’t the best solution for hands-free controls. Other, smarter systems use smaller held-held, or even wearable devices. Does this all mean that there is a small audience for this Sportstech VP210 Vibrating Plate? The biggest issue for users of this vibro plate seems to be that they are going into this model blind. Few understand what they are meant to be doing with the plates and settings. This might suggest that this is best recommended to experienced users. Yet, the features don’t reflect that. Instead, this remains a powerful, effective product for those that are willing to do a little research first – or those happy to jump aboard and hope for the best. 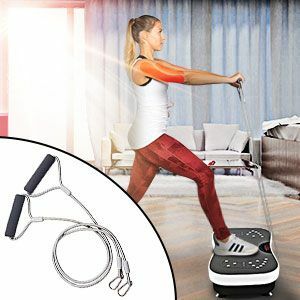 If you can ignore the manual, use some intuition and play with the settings, you could find that this Sportstech vibration plate is a great option. Find more reviews about the Sportstech VP210 Vibration Plate on Amazon here.